In this final part of our digital sport and fan engagement series, we discuss smartphone apps. These are the applications which allow the smartphone to work. They vary from social media apps, torches, fitness, train times, news, games and many more. Apps can be downloaded from an app store depending on which smartphone you own. Apple and Android phones are the most popular and their app stores contain almost 3 billion apps. 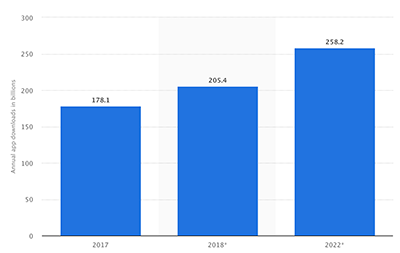 Statista state that the number of mobile app downloads in 2017 was 178.1 billion and is forecast to be 258.2bn by 2020. Revenue wise, this will equate to 188.9 billion dollars in revenue in 2020. With the growth of smartphones apps in recent years, the opportunities for sports clubs and fans are fundamental to the success and growth of clubs. We have discussed the massive use of social media by sports clubs and fans in part 1 of this series, but this post intends to delve further into some of the new opportunities and challenges of smartphone apps and fan engagement. Most sports clubs have their own website and increasingly, many have their own apps. Often, these apps serve a similar function to the website – that is, they bring in news, fixtures, highlights, match reports, scores, social media feeds, merchandise purchase etc. Clubs have realised though that fans often only use a handful of apps and therefore, they should be looking at different ways to engage fans through carefully designed apps. 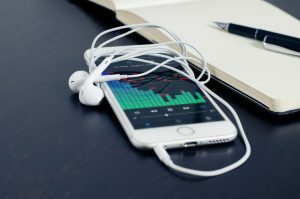 Complex app development can be expensive, so therefore clubs need to think carefully if they need an app and if so, how will it engage fans. Chelsea’s new app ‘The 5th stand‘ for example allows fans to find other fans forums around the world, fantasy league tips, exclusive content quizzes and polls. Other clubs are using apps which take advantage of the other capabilities of the smartphone such as the camera, microphone, accelerometer etc. Apps can also form an important part of the live sport experience. In part 4, we discussed the challenges such as lack of connectivity in stadiums. In order to overcome this challenge and reduce queues, some stadiums have embraced apps such as SwipeStation. Even without an Internet connection, the app allows people to pay for food and drinks using a QR code system. The idea is to make this faster for fans to reduce queue time and of course to sell more items on match days. In parts 2 and 3, we also touched on the use of augmented reality (AR) and gaming. These are both areas which sports clubs have been able to use smartphone apps to further engage fans. For example, the NBA released an app which allowed fans to shoot baskets using an AR gaming approach and Bayern Munich used an AR app to allow fans to create pictures with their favourite players. 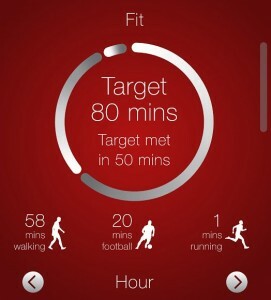 Here at Salford University, we’ve developed a new app called Fan Fit. This is an app designed for sports clubs and fans to bring in the usual news, fixtures and other key info, but has the bonus of using the smartphones accelerometer to track walking and running. We have produced a branded version for Salford Red Devils Rugby club. The app allows fans to create a friendly competition between themselves and compare their fitness scores and win digital badges and prizes so it is both gamification for fans and corporate social responsibility. It will be interesting to see what the future of smartphone apps is for clubs and fans. I think we will continue to see increasingly advanced apps which blur the boundaries between all of our five areas of digital sport for fan engagement. Imagine for example, a version of Fan Fit which uses augmented reality, artificial intelligence to give personal coaching or connecting with other IoT devices also such as fitness wristbands, gym equipment and beacons to create a completely tailored experience. With the growth of the Internet and evermore complex smartphone apps also comes changes in behaviour and disruption from increasingly hyperdigitalized young fans. Fans are consuming sport in new ways including the concept of second or third screen viewing. This is where fans are watching sports on TV, but whilst using smartphone apps at the same time, particularly from the newer generation of younger fans. There has been an increasing shift of sporting media consumption from TV to social media channels and the use of multiple mobile devices whilst watching TV or a live match. The practise of second and third screen viewing will continue to disrupt the way in which people consume and enjoy football. Some sports teams and broadcasters therefore are starting to adapt and capitalise on these changes in behaviour. Smartphone apps such as Ballr for example allows viewers to interact with a live football match using their phone by picking teams and players and winning points. Ballr taps into changing behaviour and enhances the live TV experience, but it is not a gambling app. As always, the major challenge will be to make sure that apps are designed for fans to be useful and engaging in a very competitive space. There will also be security and data protection challenges. We have only just scratched the surface with these technologies however, so this means the possibilities to succeed in this space are limitless. That brings us to the end of this five part series on digital sport and fan engagement. I very much hope you have enjoyed this series and as always, I hope to hear from you via social media. I will leave you with this great talk from an event I organised called The Future of Sporting Content Consumption from Prof Andy Miah’s talk on Sport 2.0.